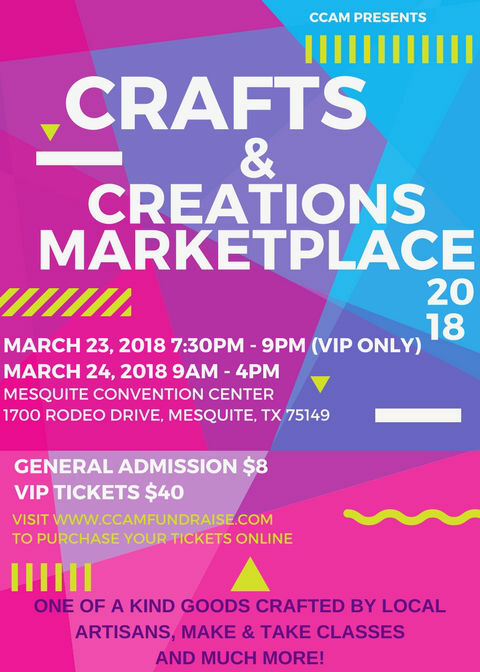 "Crafts & Creations Marketplace is an annual event to give artists a way to showcase their arts, crafts and marketplace (direct sales) products. 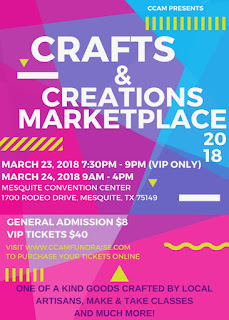 The event will take place from Friday, March 23 from 7:30 p.m. to 9:30 p.m. (for VIP ticket holders only) to Saturday, March 24 from 9:00 a.m. to 4:00 p.m. (for both VIP and General Admission ticket holders). Join us for a few hours of fun-filled activities - get the chance to meet with numerous local vendors, learn about crafty DIY tricks, and ways you can turn something old into something new with the Make & Take classes that will be offered during the day on Saturday!" Each booth will be piped and draped and will include 1 6' table, 2 chairs and signage. Applications are available here and are due by March 01, 2018 March 15th, 2018. For more information, visit their website or contact their event coordinator at craftcreationmarketvendor@gmail.com.